The ornament of the female figure, but also male, is completed with the use of rings, made in very different models. The ring is a symbol of engagement and union, but also a sign of personal representation and social status, and it has always a high symbolic value. In Pescocostanzo traditions, from engagement until marriage, ceremonial modalities were observed between the families of the spouses, and the gold sanctioned the way through the ornaments. The ring, of course, was among the gifts that the spouses exchanged. all of gold, with an engraved or raised head with a sacred, historical, mythological or family crest image. 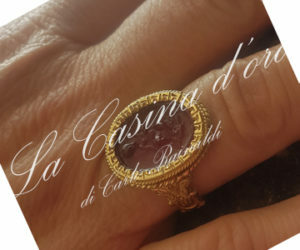 The corniola ring, typical of the goldsmith tradition of Pescocostanzo, so defined for the well-known semi-precious stone, an amazing reddish-orange-brown-color, was engraved with a female or male profile, recalling mythological or historical inspirations. This ring represented the gift that sanctioned the beginning of a journey and of a mutual commitment, and was a substitute of the actual wedding ring.